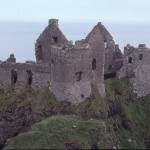 Dunluce Castle – Dunluce (Dún Libhse) Castle was built by Richard de Burgo in the 1300s. 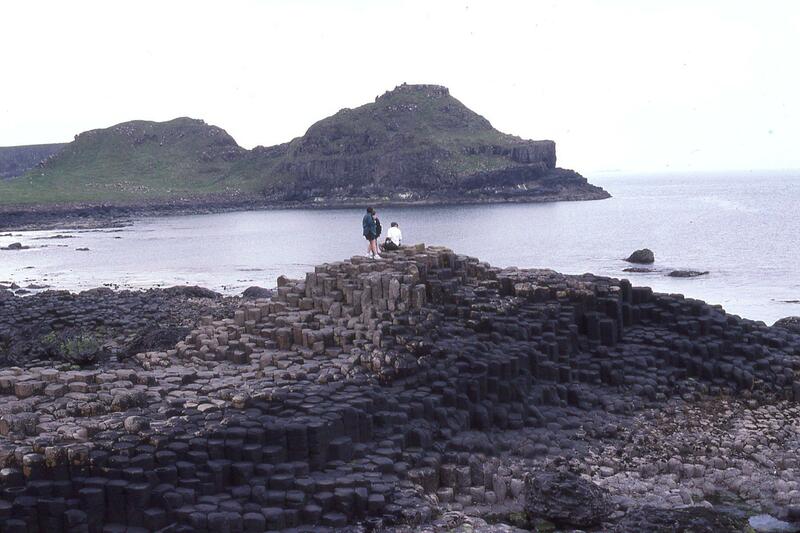 It is a keep-less, but easily defended, structure on an outcropping of Antrim’s rocky coast. 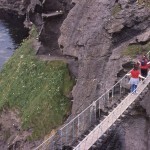 A draw-bridge to a gatehouse once connected it to the mainland. In the 1500s, the MacDonnells captured it from the MacQuillans…In 1584, the English (Sir John Perrott) took it over. Sorley (yellow-haired) Boy MacDonnell recaptured it by sneaking his men into the castle through secret passages known only by him at the base of the castle. Repairs to the castle were made by MacDonnell with money he received from treasures obtained from the Spanish Ship Girona that sunk in the defeat of the Spanish Armada in 1588. 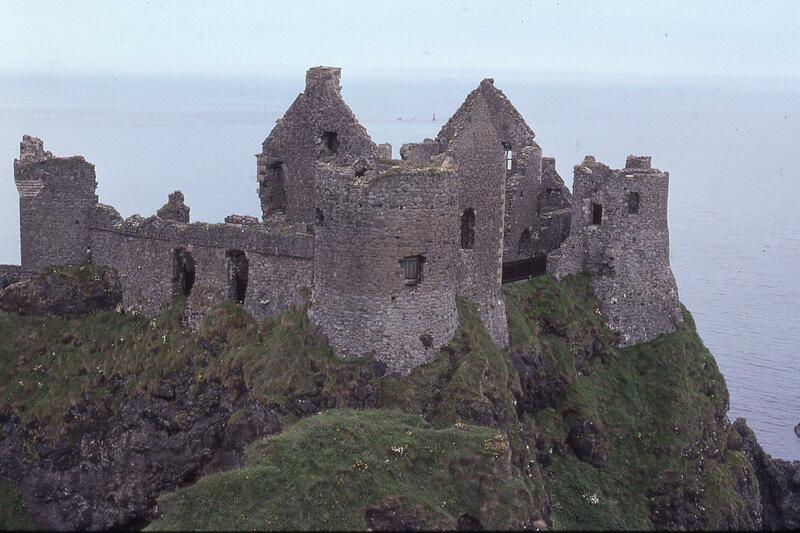 Descendants of the MacDonnells resided in Dunluce until part of the kitchen fell into the sea in 1639. Seven servants lost their lives in the tragedy, convincing the family to relocate their residence to the Antrim mainland. 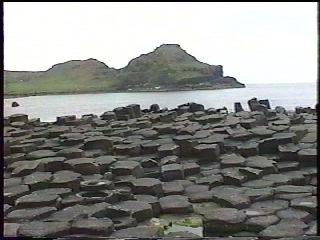 The Giant’s Causeway – The Giant’s Causeway is a unique geological phenomenon. 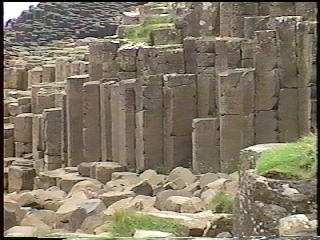 It is a massive group of individual basalt columns that have cross-sections of various geometrical shapes, usually hexagonal. The unusual geologic formations are due to the rapid cooling of lava. 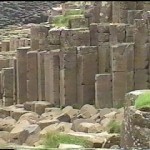 The columns stand next to each other and form steps gradually leading into the ocean in the direction of Scotland. 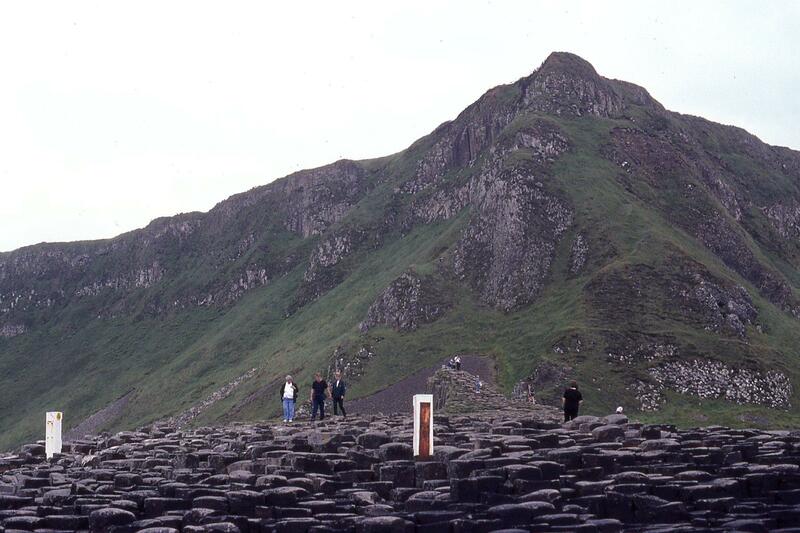 There are similar formations in Scotland. 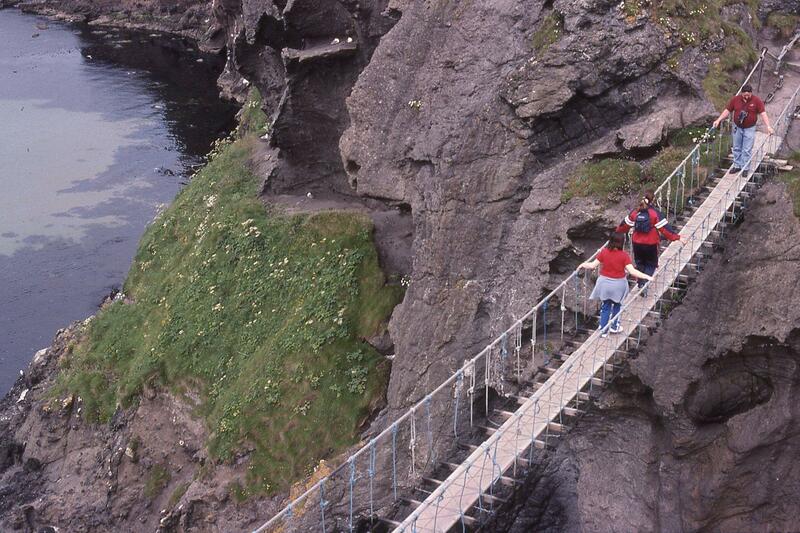 This gave rise to the legend that the giant Finn McCool built it as a walkway to visit his lady friend (and eventual wife) in Scotland. Another legend is that he built it to battle an enemy giant in Scotland named Benandonner. 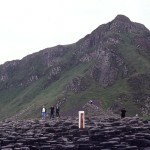 Although probably fictional, Finn McCool may have been an actual historic figure. He was said to be the leader of the Fianna, an elite military unit in the service of King Cormac (227-266 AD). Finn was a braggart and often exaggerated his deeds. His son, Ossian, was a bard and continued to exaggerate his father’s bravery in his stories. As a result, Finn moved from being a historic figure to a mythological one. 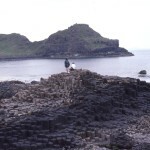 He became a giant in children’s stories and capable of heroic feats such as building the Giant’s Causeway. There is an information centre on the hill above the site. A bus takes visitors to the beach where the causeway begins. 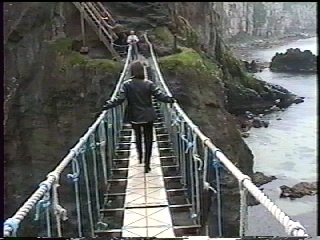 A person can step, stone column to another and reach the highest point, then step column by column down to the edge of the sea. Children love jumping from step to step. 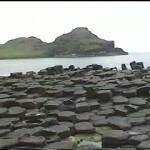 From the causeway, we can see the green mountains and lava needles along the Antrim coast. 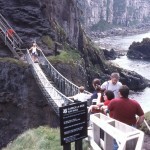 The Carrick-a-Rede Rope Bridge – Farther down to the east of the Giant’s Causeway, there is the Carrick-a-Rede bridge. 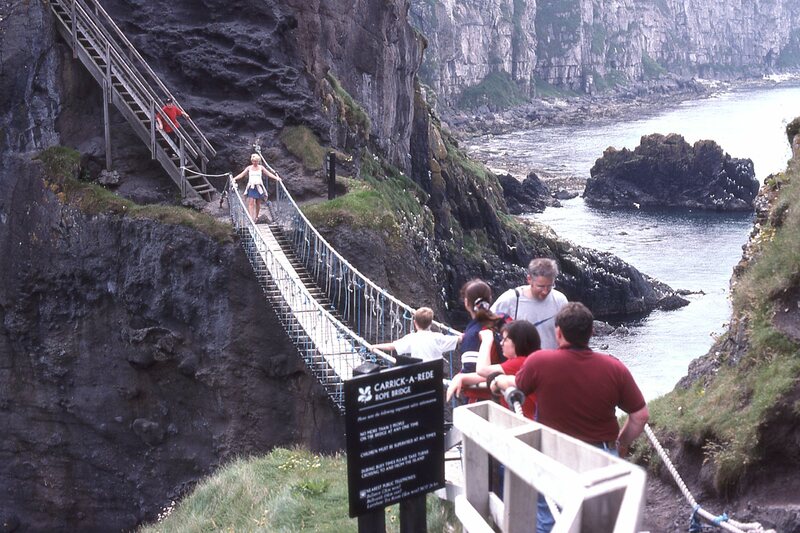 The Carrick-a-Rede Bridge is a rope bridge 80 feet above waves crashing on rocks between the mainland and a small island used for salmon fishing. 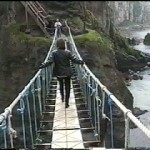 The bridge shakes and sways as one walks over it. Only three people can cross at a time. The rather large Rathlin Island can be seen just off the coast.